Procedure_Start - This label marks the initiation of a Procedure and occurs prior to any calls to load object resources and prior to Procedure_Timeline_Start. 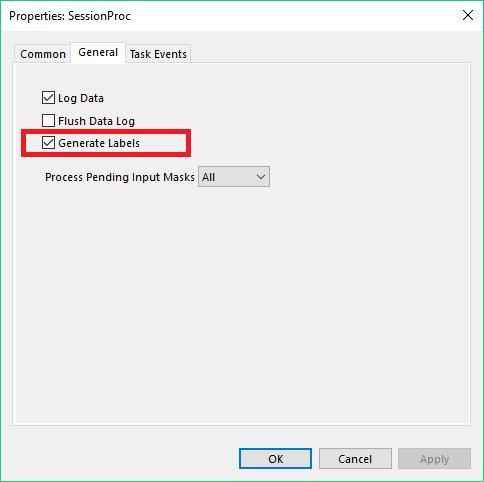 If the GeneratePreRun property for any objects is set to TopOfProcedure, the .Load script for those objects will be generated relative to the Procedure_Start label. Procedure_Timeline_Start - This label marks the beginning of the Procedure events, and occurs following Procedure_Start and prior to any calls to run objects. Procedure_TimeLine_Finish - This label marks the end of the Procedure events, and occurs following all calls to run objects, prior to logging to the Context. Procedure_Finish - This label marks the conclusion of the Procedure script execution, after the Context has been logged. Procedure_Finish should not be used without calling c.Log or handling custom data logging. Procedure_Feedback_Start - This Label occurs before script execution for a Feedback Object commences. Procedure_Feedback_Finish - This Label occurs after script execution for the Feedback Object in the Procedure concludes. Calling GoTo Procedure_Feedback_Finish in an InLine Object prior to the Feedback would skip the Feedback Object. To access this option for a Procedure, open the Procedure Properties. On the General tab, check the option to Generate Labels.